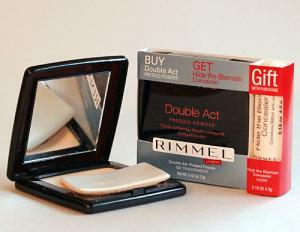 This Rimmel product review is for their Double Act Pressed Powder. Let me start this Rimmel review with a brief history of my skin type. I am an oil monster and have been since puberty. My skin seriously pumps out the shine and although I have been told it will help keep those wrinkles at bay, I am particularly found of the matte look instead. Therefore, since the ripe age of fourteen, I have been using face powder excessively. Given this history, I have tried numerous powder-related products over the last twenty-plus years. I have bought them as expensive as $40 to the cheaper drugstore brands on sale at $2 a compact case. I have evaluated both loose and pressed powders, in a large variety of brands. In short, I feel relatively qualified to evaluate the effectiveness of face powders for oil control. Luck struck me one day at my local outlet store; I came across a bin of makeup at deep discounts. Always on the hunt for a bargain, I noticed a large stash of a powder product I have never heard of before, Rimmel Double Act Pressed Powder. Always willing to give a new powder a try, I bought one in the Transparent Shade. Let me just say, after a couple days of using the powder, I went back to the same store and bought all they had left in the same Transparent Shade - some 15 compacts. So, now I am well stocked in oil-control heaven for the next year. Inexpensive - with a suggested retail of $6 and the opportunity to buy it on sale at $3, this is certainly a less expensive makeup product. Long Lasting - I had always had trouble with mass-marketed pressed powders that would harden after using up about half of the product. I always had to throw these away before the powder was truly finished. Not with Rimmel's Double Act Pressed Powder, it looked as good on my face the first time I used it, down to powdering my nose on the bare scraps. Color - The Transparent color is truly clear and did not change the color of my skin - only erasing the oil. Long Oil Absorbency - The product claims to last all day, but with my skin, nothing controls my oil all day. Alas, Rimmel did outperform any other powder I had ever used in the past - even the costly Clinique Makeup ones I had loved previously. Smell - Even though it lists fragrance in the ingredients, the smell is barely there. I have had trouble with some powders where my husband would refuse to kiss me due to the smell of my face, but not with Rimmel. Difficult to find - Not a mainstream brand, so it is not available everywhere. I am certainly well stocked for now, but I do worry about finding more down the road. Ingredients - Not a natural, chemical-free product by any means. As printed on the package - these are the Double Act Powder ingredients: Talc, Mica, Caphrylic/Capric Trigyceride, Polyehtylene, Octyldodecyl, Stearoyl Stearate, Bismuth Oxychoride, DI-PPG-3 Myristyl Ether Adipate, Titanium Dioxide, Silica, Polyglyeryl-3 Diisostearate, Methylparaben, Lecithin, Phenoxyethanol, Silica Dimethyl Silylate, Propylparaben, Tocopheryl Acetate, Fragrance, Polysorbate20, Butylparaben, Ethylparaben, Water, Isobutylparaben, Butylene Gylco, Sodium Stearate, Hydrolyzed Wheat Protein, Atelocollagen, Sodium Chloride, Sodium Chondroitin Sulfate, Isoproplparaben, may also Contain Iron Oxides and Ultramarines. The company was originally started as a perfumery known as the House of Rimmel. Their cosmetic line was released in 1834. The founder, Eugene Rimmel discovered the first completely non-toxic mascara product, which became so hugely popular in Europe that rimmel is the word for mascara in many languages including French and Italian. Currently, the brand is known as Rimmel London and is owned by Coty, Inc.